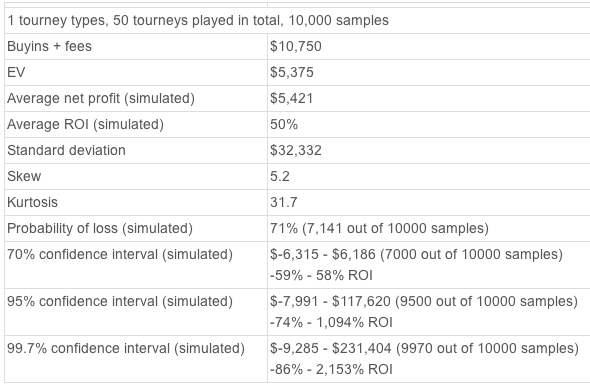 The Poker Tournament Variance Simulator calculates variance for poker tournaments, MTTs and SNGs. Enter your tournament(s), hit calculate and let the simulator do its magic. An explanation how this simulator works can be found below. 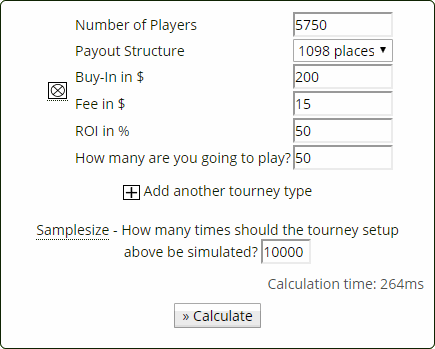 How does the Poker Tournament Variance Calculator work? Let's go through an example simulation. Players: Number of players for the tournament. We assumed 5,750 players (entries) for the Sunday Million. Structure: How many places get paid. Standard payout tables are used. You can also choose satellite structures. Buyin and Fee: In any currency you fancy – buyin must be greater than zero. Buy-In for the Sunday Million is $215, but for this calculator we split up the real buy-In ($200) and the fee ($15). ROI: In percent, any value greater than -100% is ok. Let's just assume, we have an ROI of 50% in the Sunday Million. How many are you going to play? : How many tournaments should be simulated. For this example we want to know what results we can expect over the course of one year. That's roughly 50 weeks and 50 Sunday Millions. Sample size: How many samples should be simulated - higher numbers yield more accurate results, but also take longer to compute. 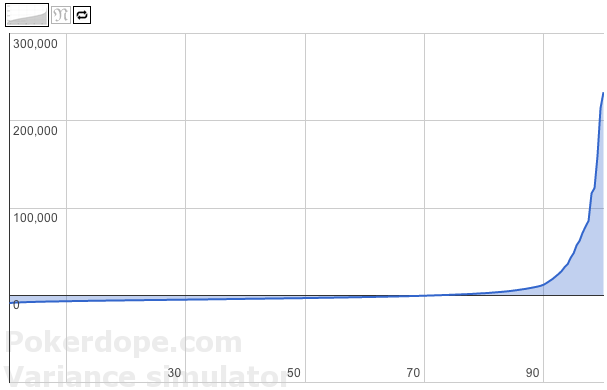 Click on Calculate and the Poker Variance Calculator does its magic. It simulates whatever tournament schedule you have entered over as many samples as you have entered. In our example it would simulate 50 Sunday Millions 10,000 times. This distribution shows the cumulative likelihood function for the results. In this example it shows you that about 70% of all samples had a negative result and only the top 5 percent of the samples showed significant winnings. By clicking the the "N"-Button inside the diagram you can compare the distribution to how a normal distribution (with the same expected value and standard deviation as the original distribution) would look like. The next graph shows 20 sample runs from the simulation as well as the best and worst run over all samples. In this example, in at least one sample we managed two first places (not that unlikely over 10,000 samples) and most other samples show much lower winnings. Lastly the Tournament Variance Simulator shows some interesting statistics, like your probability of loss, your 70, 95 and 99.7 confidence intervals as well as the statistical standard deviation, skew and kurtosis. In our example, 50 Sunday Millions, the probability of loss is a whopping 71% despite having an ROI of 50%. Obviously, since poker tournaments are so top-heavy it needs a lot more than just 50 tournaments to turn this ROI into a secure income. All those numbers are derived by Montecarlo simulation, thus they are not completely accurate. But going with a decent sample size (1,000 or more) they are correct within a 2%-margin of error. You can enter up to 10 different tournaments, MTTs, SNGs or sit-and-gos and the Tournament Variance Simulator will simulate the whole schedule. By clicking on "Compare tournaments" you can compare the distributions of the different tourneys you entered. Should you have any questions, remarks or feedback, please leave a comment! qu est ce que tu racontes, sur quoi tu te base pour dire que c est de la merde ? Je trouve au contraire que c est tres fiable. Sample size is samples of those 4800. -What is the difference between the number and the number. I assume that the number is how much I plan to play of this format; and that the samplesize is the times I run a simulation based on this n-amounts of times I want to play? So if I plan to 50 sit and go’s; with a sample size of 1000; then the tool calculates its varians distribution based on a simulation where I play 50 games for 1000 times ? ? ? – Its hard to determine your ROI as it is dynamic. If you have a tracker and tracked how many 180 sng of 2.5 you played, you can get a raw estimate of your ROI. – In simple words skew and kurtosis are statistical properties that discribe how a distribution differs from a standard normal one. I think in this application, you need to look at it as an indicator for reliable results in all other estimates. If both are 0 (which is the case for standard normal distribution) you can rely better on the results then if they where different from 0. You want to assume a stardard normal distribution (aka skew and kurtosis = both 0), because you want to have your errors/variance balanced (= as much as good runs as bad runs). Obviously, this will be the case when the number of tournaments and/or the sample size gets higher and higher. I’ll consider this for next time. Thanks. It will be cool to know, what is the probabillity of worst run? would it be possible to include spin and go ? With the probabilities of jackpot i would be interested to see simulations. Which satellite do I have to select, to run a Hyper 6max with two tickets? I don’t really understand the satellite distribution. I have 1 question though.When it comes to calculating variance and SD in a non-winner take take all tournaments(like 6man or 9man SNGs),what formula or algorithm do you use to actually calculate SD for those?I mean when it comes to those formats with a set payoff structure(65-35,and 50-30-20)I would assume that in order to calculate variance and SD for these formats you have to know what % of the time should a player finish in each place when he is ITM and also how often does he not finish ITM.But since the only ”money regarded parameters ‘ here are a player’s ROI,a preset optional pay off structure and buy in size,how do you actually determine what % of the time a player finishes in each of the above stated positions based only on these three parameters,since ROI and ITM finish % s are not proportionate mathematical sizes(i.e.if someone has higher ITM % finishes than other does not mean that he is more profitable player, and also if two players have the same ITM % does not mean hat they have the same ROI) and can you give me a brief example? Very useful, thank you. Consider adding a dead/added money option to calculate outcomes of loyalty freerolls, guarantees with overlays etc. Please add a possibility to add Twister SNGs and Spin & Go, where only 3 players, and 1 buyin out of 3 payed goes off to the Jackpot. I use your calculator mostly for sit n gos with 6 entrants where first pays 65% of the prizepool and 2nd pays 35%. I don’t think the pay outs for two players paid out of 6 total entrants are the correct 65/35 that I need. Could you verify that? I find this tool most useful but is there a way to add “winning and losing streaks” into the equation? I’m playing Jackpot games on I-Poker at an 18% ROI over a 500 sample and I know my graph is towards the top end of your calculations. Even with such a high ROI my biggest streak is 2 wins and 8 losses and I’d just like to know over what sample I’d have a chance at winning a jackpot. Many thanks for a great tool. Could you add calculation of profits with cuts, commonly used in stacking now? You just need in each profitable sample to subtract cuts. It would be good to have all these statistics not only from a player’s point of view, but from a backer’s point of view too. All backers will really appreciate it. That’s a feature I might (most likely will) add in the future. Right now the first diagram already shows you the probability of winning less than amount Y. 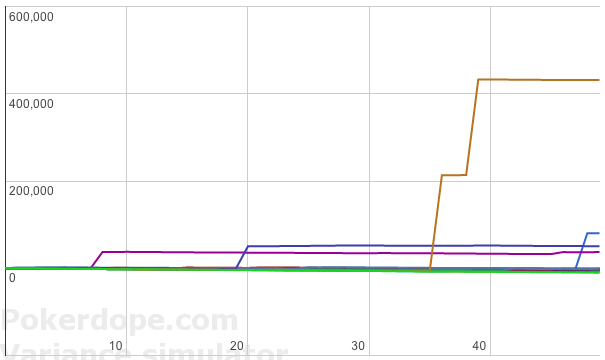 You can hover over the graph to see the values. But this only shows downswings which occur at least .5% of the time. Very nice tool, when I went on a 125 buy-in downswing over about 1,000 to 1,500 tourns with an approx 15% ROI on Bovada I became suspicious that it was rigged in some way so I started writing my own simulation program…before I could finish it I pulled out of the downswing and abandoned it. Your program that you created is largely what I was trying to do. It shows 1 sample out of 1,000 to be that of a losing player, and I’ll bet that one player didn’t lose 125 buy ins also! How would I figure out what the probability of going on an x buy-in downswing over y sample would be? Do you have plans to add this feature? You made an excellent program! This will be difficult. The calculator translates the ROI to ITM and assumes, your finishing positions will be evenly distributed. For example, say you’re playing a $10 tourney (no fee) and 3 places get paid. If you assume an ROI of 20%, the calculator translates this to an ITM rate of 36% where you will finish on positions 1, 2 or 3 with a probability of 12% and will finish on positions 4 – 10 with a probability of ~9.14%. I think you are the only only who understand and knows how to use this tool.